Was it right to pass Israel’s Nation-State Basic Law? Recently, Israel’s Knesset passed by a 62-55 margin, Basic Law: Nation-State. Israel does not have a formal constitution, but rather a set of basic laws with quasi-constitutional status. Among these basic laws are those that deal with structural issues, as well as those that anchor human and civil rights. The new basic law anchors the definition of Israel as the nation-state of the Jewish people, a definition that has never been regarded as controversial, and enumerates its language, symbols, anthem and other fundamental matters. The legislation aroused a lively public debate and much interest in the international press. In this brief post, I will lay out some of the arguments against the Basic Law and evaluate them. This claim is backed by historical and moral arguments. The historical view argues that the nation-state can easily descend into fascism. Morally, the argument is that the nation-state, by definition, discriminates between citizens and turns those citizens who are not members of the nation into second-class citizens. However, this argument is easily refuted as the right to self-determination in a nation-state is recognized and anchored in international human rights documents. Many western states are nation-states, and their number has only increased with the collapse of many multi-national states since the end of the Cold War. In fact, the most virulent opponents of Israel as a Jewish nation-state support the right of Palestinians to a nation-state of their own, and thus do not actually object to the principle as such. The new basic law anchors the definition of Israel as the nation-state of the Jewish people, a definition that has never been regarded as controversial, and enumerates its language, symbols, anthem and other fundamental matters. This argument comes in two versions. In the first, Judaism is not a national identity, and therefore the Jews have no right to a nation-state. In the second, even if the Jews are a nation, they have no claim to the Land of Israel and have no right to self-determination within its borders. The former is supported by the argument that nationalism is a purely modern phenomenon with no basis in human history. As far as the modernist school is concerned, not only the Jews, but all nations were “imagined” or created within the past two centuries. Of course, this claim is hotly contested. Moreover, in the specific case of the Jews, modernists have to jump through hoops to defend their thesis. In contrast, non-modernists like Hastings and Smith can point to the Jews as the model of pre-modern nationalism. The right of the Jews for self-determination specifically in their historic homeland seems obvious and has been internationally recognized, but I shall not belabor this point here. Those who criticize the Basic Law claim that Israel’s status as a Jewish nation-state is already anchored in various laws, and thus has no need to be upgraded to a constitutional level. This argument doesn’t hold water. In nation-states, constitutions typically anchor the national character of the state. This anchoring is not redundant because it strengthens the status of similar principles found in regular statutes. The need to anchor Israel’s nation-state status in a Basic Law is no different than the need to anchor human rights in two Basic Laws in 1992, despite ample existing laws and jurisprudence protecting such rights. The “Constitutional Revolution”—which took place in 1992 with the legislation of the two aforementioned Basic Laws—turned Israel from a parliamentary democracy into a constitutional one in a hasty and problematic manner. Thus, it could be argued that the passage of this new basic law, with the support of opponents of the revolution, signals acceptance of the revolution despite its deficiencies. This argument is overstated. The Constitutional Revolution took place over twenty years ago, and the moral force of the opposition to the Supreme Court’s conduct has, in any event, faded with the passage of time, so that passing a new Basic Law hardly matters. While an ordinary law that enjoys legitimacy even if passed by a small majority, the legitimacy of a constitution depends on (among other things) a public consensus in its favor. Of course, complete unanimity is impossible, but widespread public support is necessary. The principles included in Israel’s Basic Law: Nation-State are justified. These principles should be included in a constitution alongside structural principles and a commitment to protecting human rights. Yet, while this is a good law and I’m pleased that it passed, I regret that it did so with a slim majority and in retrospect would have preferred that passage of the law be postponed until a wider consensus could be achieved. Featured image credit: Dome of the Rock by bluskyhi. CC0 via Canva. 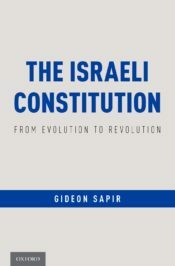 Gideon Sapir is Professor of Law at Bar-Ilan University, Israel. He is the author of The Israeli Constitution: From Evolution to Revolution, a forthcoming release from Oxford University Press. Who are the Jewish people? Until the 19th century they were those who practised the Jewish religion, more exactly those who had been brought up in the religion by a Jewish mother, herself brought up in it by a Jewish grandmother – that or a convert. Surnames were only coincidentally Jewish, reflecting the fact that Jewish women usually married Jewish men. After the Enlightenment a problem arose: more and more Jews wanted to abandon the religion and live as secular nationals of the State they lived in. Christians and post-Christians were not easily going to give up their prey; the ‘racial’ theory was widely adopted. There were many Jews who accepted it, allowing themselves to be called ‘Jews’, without practising the religion. When Hitler started persecution, he defined as a ‘Jew’ anybody with at least one Jewish grandparent. This multiplied their potential number by four, for by the traditional definition only the maternal grandmother counted. Israel adopted the ‘racial’ definition for its Law of Return. Where does that leave secular ‘Jews’ who identify with the country they live in? Israel’s new law threatens to make it permanently impossible for them to throw off the ‘racial’ identification that they reject. Israel, Taiwan, and South Africa used to form a loose alliance of shunned states. Taiwan and South Africa have either adjusted their notion of their place in the world or reimagined their internal politics. Israel, to the outside world, appears to have doubled-down on its policies.